Chicago Cubs fans are still celebrating history! The Cubs finished an amazing 103-win regular season with a World Series Championship, which was followed by the announcement of Kris Bryant as the 2016 National League Most Valuable Player. To honor Bryant's amazing season and celebrate his successes as the young third baseman embarks on what has so far been a Hall of Fame career we are proud to announce the release of this beautiful Kris Bryant Signature Translucent MVP Bat! 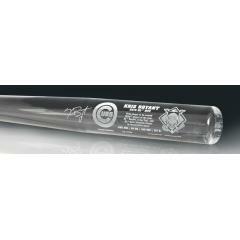 Each of these full-size collectible bats includes professionally etched Kris Bryant facsimile signature, his 2016 award-winning stats, as well as notable achievements from his young career including 2014 MiLB Player of the Year and 2015 Rookie of the Year. This full-size, translucent bat is the perfect addition to any Cubs fan's collection. Order your bat before they are gone. Due to the limited release of this item we must charge your credit card for the full price immediately upon taking your order. This policy ensures we reserve a bat for you. We will confirm your order by email. This very attractive translucent bat is crystal like in appearance and weighs approximately 5 lbs. If dropped, the bat may shatter like glass. This unique bat is officially licensed by Major League Baseball.